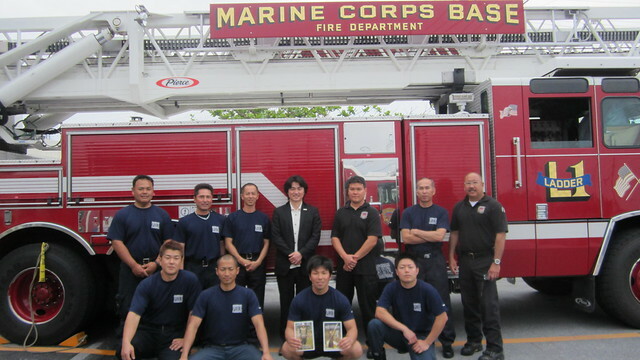 Immediately following the radio interview, KIF Okinawa Deputy Executive Director Mr. Holland and Koyamada headed for a meet and greet session with the firemen from the US Marines Corps Base Fire Department at Camp Foster in Chatan Town, Okinawa. Arriving at the fire station, Koyamada greeted and spoke to every fireman, signed autographs on photos of himself, and had group and individual photos in front of the fire trucks. The American and Japanese firemen were happy to meet Koyamada and thanked him for stopping by the station and taking time to meet and greet all the firemen.